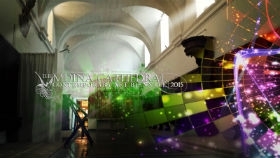 da novembre con la direzione artistica di Giuseppe Schembri Bonaci, che coinvolgerà l'intera città di Mdina, la vecchia capitale dell'arcipelago, intesa come un'unica sede espositiva sul tema di Christianity, Spirituality and the Other"
Kollezzjoni rara ta' pitturi tar-rebbieħ tal-Premju Nobel Dario Fo, se jiġu murija waqt l-ewwel edizzjoni mill-ġdid tall-Biennale tal-Imdina. 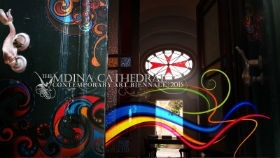 Nobel-winning playwright Dario Fo will be visiting Malta to exhibit some of his latest theatrical and visual work at this year's Mdina Cathedral Contemporary Art Biennale. 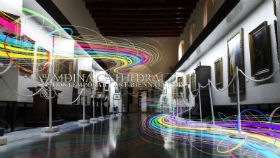 Johnathan Cilia speaks to artistic director Giuseppe Schembri Bonaci about the intricacies of inviting an atheist to put up an exhibition about St Francis of Assisi. 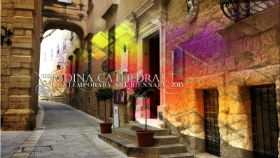 The Mdina Cathedral Contemporary Art Biennale will be held in various historical places in Mdina, with the main accent being on the St Paul's Cathedral, between 13 November and 7 January. 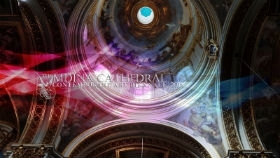 Applications are being received for a composition competition as part of a concert of a capella choral music 'Versus – Of God and Man' which will take place at the Mdina Cathedral on November 25 as part of the Mdina Cathedral Contemporary Art Biennale between November 13 and January 7. 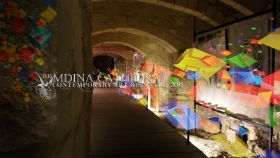 The Mdina Biennale has been featured on leading contemporary art online newspaper Artdaily.org. Click on the following link to view the feature.